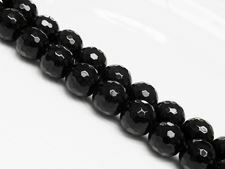 Blackstone is a dyed opaque gemstone chosen from various stones, which are abundantly available, and mainly from jasper varieties. 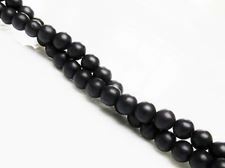 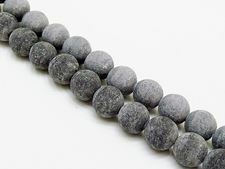 Dune beads' frosted Blackstone will give any design a striking modern feeling. 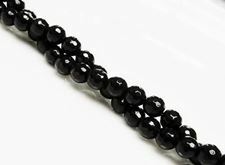 The spiritual value is linked to its black color and is said to intensify the value of other stones. 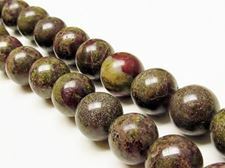 Heliotrope, commonly known as Bloodstone, belongs to the chalcedony group of the quartz family, just as carnelian and aventurine. 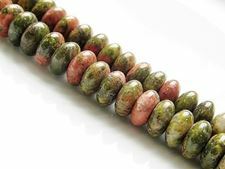 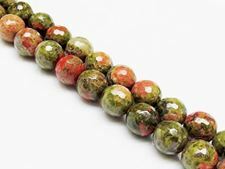 This colorful dark green gemstone owns its color to sediments of marine water and has some spots of red jasper. 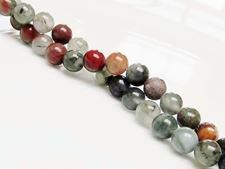 Each stone has its own unique look. 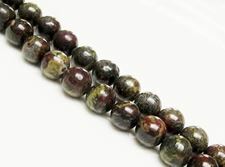 Also, it is the traditional birthstone of March and it is said to give courage and strength. 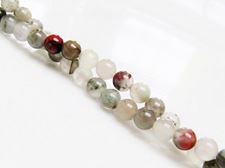 It should heal the broken hearted. 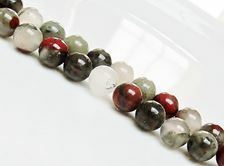 Mottled Unikate granite stands for "growing together" and consists of an amalgamation of a pinkish red moonstone type of feldspar and moss green Epidosite, the latter being composed of Epidote and quartz. 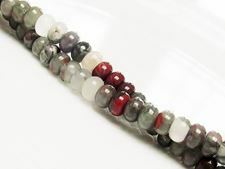 This gemstone permits to envision your spiritual life and to grow.